Our wines are made from grapes grown locally at our Berryessa Gap Vineyards. These grapes come from our own rootstock which has been a staple of our owner’s business since 1969. We are extremely proud of our wine country heritage and of the award-winning wines we produce here. All of our fine wines are available for purchase online as well as at our winery and our downtown Winters tasting room. As a member of our Wine Club, you will have the benefit of receiving 15% off of a single bottle and 25% off of case purchases. Berryessa Gap Winery is very active in planning and participating in various events throughout the year. 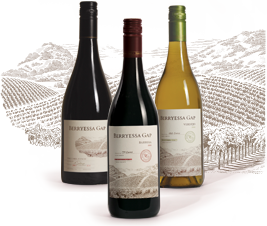 Contact us to make arrangements to sell Berryessa Gap Wines at your restaurant or retail outlets. Meet our team of dedicated professionals who strive to make Berryessa Gap Wines the best they can be.